The Presidency will on Tuesday, the 31st of October host the leadership of the National Assembly in a dinner at the Presidential Villa. No more protocols for National Assembly leaders wishing to visit the Presidential villa. 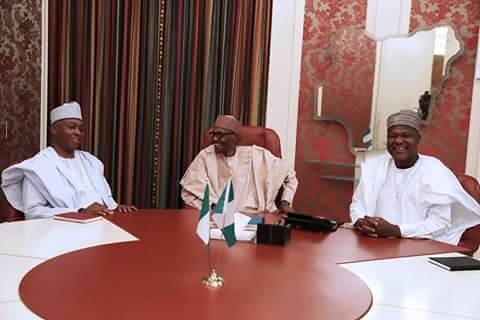 After an embarrassing moment that nearly cost Mr. President his dinner with National Assembly leaders, the President has now decided that all of them should have express access to the villa anytime they wish to visit. President Buhari stated his displeasure with the development and apologised to the legislators for what transpired between them and the security guards before hosting Senator Bukola Saraki and Hon. Yakubu Dogara to a private dinner. The Presidency will on Tuesday, the 31st of October host the leadership of the National Assembly in a dinner meeting at the Presidential Villa. Meanwhile a previously held dinner meeting on Thursday was attended by the Vice President, Prof. Yemi Osinbajo, Chief of Staff to the President, Mallam Abba Kyari, the Senior Special Assistant to the President on National Assembly(Senate), Senator Ita Enang and the Senior Special Assistant to the President on National Assembly (House of Reps), Kawu Sumaila. Recall that reports had gone viral on Thursday citing a lack of access into the villa by the leadership of the national assembly which led to their angry exit from Aso Rock. But what actually happened was that a private dinner was held in place of the official dinner before President Buhari announced the postponement of the meeting to Tuesday. The meeting/dinner is to bring about a parley between the legislative and the executive, and ensure there’s a harmony in their activities while they discuss and take actions on issues of importance to Nigerians.